Biolan 125 Greywater filter’s design is based on mechanical and biological filtration of wastewater. Waste water travels through the media and suspended solids are removed. Micro organisms living in the media break the contaminants down in the presence of oxygen. Water flows through the trays of media in series purifying the water. 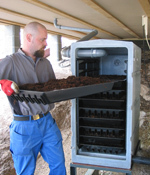 The Greywater Filter 125 consists of ten filter boxes placed one on top of the other. The greywater enters into the uppermost filter box. The wastewater cascades from one filter layer to the other through the openings in the end of the boxes. Air flows in through the lower air valve in the rear wall and out through the upper valve. The oxygen supply to the micro-organisms is essential for the operation of the unit. The filter can deal with a small amount of antibacterial chlorine based cleaning products. 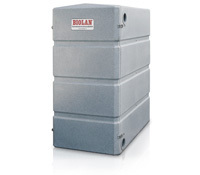 The Biolan greywater filter is made of frost-resistant materials and it is thermally insulated. The metal parts are of stainless steel. The unit is reliable in operation and long-lasting. Place the greywater filter on a firm and even surface that is not susceptible to frost, such as, a bed of gravel or crushed stone or a cast concrete slab. The filter must be in a horizontal position both lengthwise and laterally to allow the wastewater flow smoothly and take advantage of the entire cleaning surface area of the filter material. 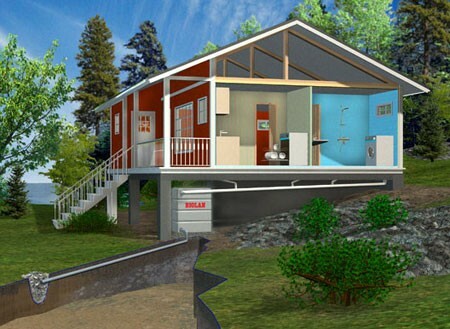 While installing gravity flow sewers, a sufficient gradient (of at least 1-1,5 %) needs to be provided to allow the greywater to flow without obstruction from the house all the way to the discharge point. There are inlet and outlet connectors for 75 mm sewer pipes on both sides of the modules. The inlet connectors are located at the upper edge and the outlet connectors at the lower edge of the modules. The inlet connectors of the modules are joined together using connecting pipes and a branch sleeve. The sewer pipe coming from the building is connected to the branch sleeve that joins the modules together. By means of the branch sleeve, the wastewater flow is distributed evenly to both modules. The even distribution can be ensured by installing a straight part 80 cm long in the inlet pipe before the branch sleeve to reduce turbulation of the incoming water flow. The outlet connectors for purified water are located at the lower edge of the filter, on both sides of the modules. The purified wastewater can be conducted to the discharge point either separately from each module or by joining together the outlet connections of the modules using an intermediate pipe (not included in the delivery) and conducting the water out through the outlet connector of one of the modules. The outlet connectors of the modules can also be joined together using similar branch sleeve that was used in the inlet pipe. The the discharge point for the purified wasterwater can then be located between the modules. The excess inlet and outlet connectors shall be closed using the plugs included in the delivery. If the purifier is to be used in winter, the inlet pipe must be insulated. Whether the outlet pipe needs to be insulated shall be considered case by case. The filter material has been placed ready on the trays inside the unit. For transportation it is packed in plastic bags. Remove the plastic bags. Finally, draw the filter material about 5 cm to the rear from the V-openings in the discharge end of the box. The operation of the filter is based on the activity of micro-organisms. The micro-organisms need oxygen to survive. Therefore, the air exchange in the filter must be considered. There are two adjustable disk valves for ventilation in the rear wall of the modules. Set both disk valves of the module about 10–20 mm ajar for the summer. In winter keep the valves only slightly ajar (about 5–10 mm).